The bus station and the Mereb Hotel are on the opposite sides of town, but I do not mind to walk a few kilometers, and Mendefera has a good climate. After checking in I can start a long walk through the village and up and down the many hills surrounding Mendefera. Every climb results in a nice view over Mendefera and a good idea for the next climb. 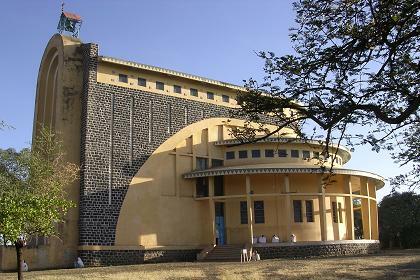 All the larger religious buildings are build on a mountain top. To be closer to God? 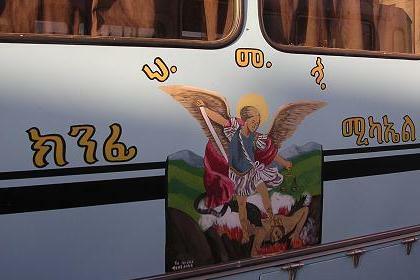 Going to church must be a real sacrifice for the old aged Eritreans. I spent the whole day visiting every edge of Mendefera including the outskirts, followed by children who want to be pictured. At the police station I try to get a permit for a visit to Adi Quala. 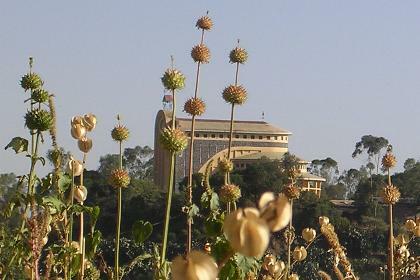 They tell me I have to go to Asmara, the Ministry of Foreign Affairs. Instead of a permit I get a thorough check. Routine? Maybe they do not understand why a tourist wants to visit a war scene. 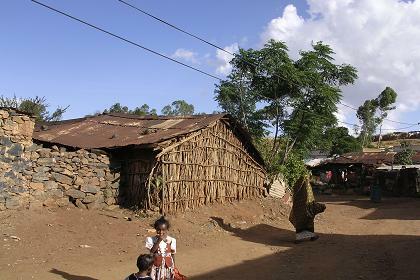 There is only Eritrean visa in my passport, so no chance there will be any problem. After 15 minutes they give me back my passport. Saint Michael will protect us during the trip to Mendefera. The landscape some kilometers outside Mendefera. 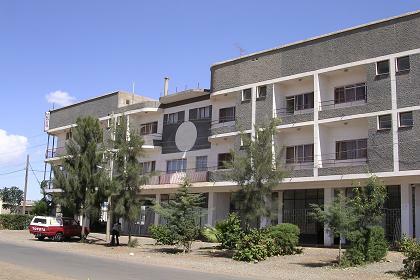 New build and top class Mereb Hotel - Mendefera Eritrea. 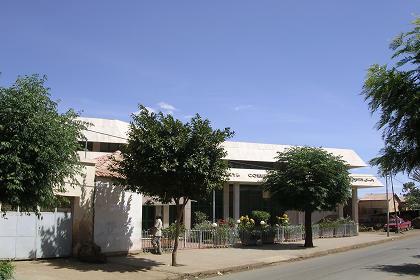 Offices of the Commercial Bank of Eritrea in Mendefera. Georgis Coptic church pictured from one of the opposite hills. 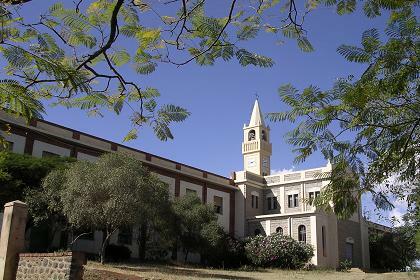 Georgis Coptic church and compound - Mendefera Eritrea. Catholic church and school on one of the other hills of Mendefera. 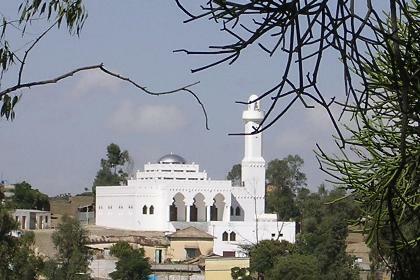 New mosque of Mendefera on the next hill top. 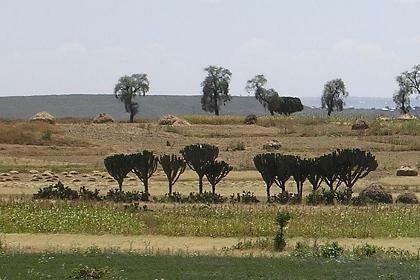 Passing the outskirts of Mendefera on my way to the mosque. 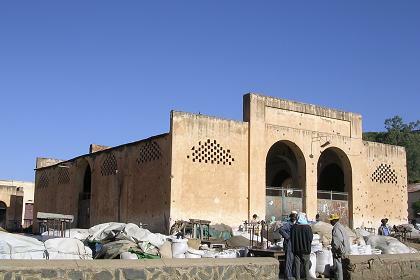 Grain and spices market - Mendefera Eritrea. 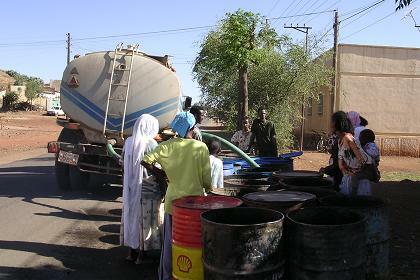 Delivery of water for those not connected to the public water works.